TPA’s Summer Nights at Don The Beachcomber Begin! Summer got off to a great start on Sunday, June 14 as Theme Park Adventure fans gathered at Don the Beachcomber for our first Summer Nights mixer of 2015! 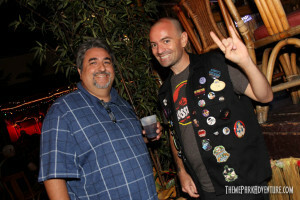 Tiki drinks and lots of laughs were in abundance as fans of all ages, haunters, and industry professionals mingled, talking shop while getting to know each other better. All the while, shenanigans were on tap, as music played and guests enjoyed the grab-n-go food station set up by the staff at Don the Beachcomber for us. This month, we unveiled a brand-new TPA tiki logo by our good friend, Tom “Thor” Thordarson – which he drew in the likeness of Don the Beach himself, straw hat and all! It is a very cool design, and our TPAers love it! We gave 30 Summer Nights buttons away to the first TPAers to show up at 7pm, and will continue to give another 30 away at the beginning of our next mixer in July! When Britain’s most famous ocean liner was still a dream, the Cunard Lines recruited the John Brown shipyard in Scotland to build what would become the world’s most famous ocean liner. 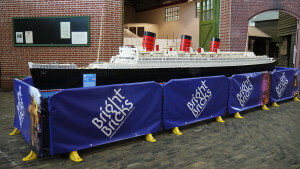 When Britain’s certified LEGO builders, Bright Bricks Inc. decided to commemorate the ship in LEGO Bricks – they never dreamed the huge model would someday come to Long Beach and be displayed on the actual Queen Mary. “The agreement to display our model on the ship is the perfect end to a wonderful LEGO adventure,” said Bright Bricks co-founder, Ed Diment. The LEGO company certifies only a few official model makers; Bright Bricks is located in England and is a well-established creative resource. “Companies from around the world hire us to interpret their products or brand using LEGO bricks. But, in this case, we decided to build the Queen Mary for our own satisfaction. It required four professional builders and over 250,000 individual LEGO bricks. It took almost four months to complete the project,” Diment added. Dollar Days are back! Hot dogs, grilled corn-on-the-cob and watermelon slices are only $1 each for a limited time. It’s not the Fourth of July without these classic American treats! Dollar items will be sold at specific locations. 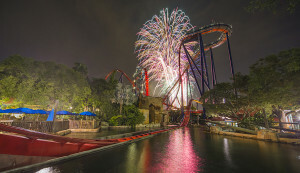 Cool down on these hot summer days and enjoy Oceans of Fun until 9 PM on Friday and Saturday.